Learning to ski is no easy feat for adults and for little ones it can be even more challenging, or so I have learned over the last few years watching and skiing with my two daughters. Teaching kids to ski is an entirely different situation and one I confess am T.E.R.R.I.B.L.E. at, or at least feel I fall flat on. When this article originally posted in Feb. 2013 we were just starting to teach Princess Two how to ski. On a adult-only ski weekend I had the opportunity to do an impromptu interview with one of the ski experts at Vail Resort to get tips on how to get your kids ready to ski even before they hit the slopes. Guy Sedillo, product manage of training and quality and a previous ski instructor shared several tips with me. I’ve since added a few lessons we’ve learned along the way regarding teaching kids how to ski. The biggest lesson – for parents – take a deep a breath, (pray for patience and no injuries) and just let them ski. 1. Play in the snow, really just play. Kids who are active and physically fit typically have an easier time learning to ski. But, if you have the chance to play in the snow do it. It’s fun and for kids who don’t live in areas with snow, and according to Guy Sedillo it helps them become more familiar with how it feels and moves, which will be helpful during their lessons and time on the slopes. 2. Don’t try to teach your kids to ski yourself unless you’re a certified ski instructor. The reason, according to Guy, is that certified ski instructors teach kids techniques kids can understand and do at their own level and their own pace. After the last few years skiing with my kids, I wholeheartedly agree with this recommendation. With that said, you can and should still work with your kids to help teach them to ski. Meaning, after a day of lessons go do an easy run with them to see what they learned. And, after a day or two of lessons take them up yourself and work with them. Make sure you understand what they have been learning in ski school to ensure you’re communicating the correct techniques…and what runs they should stick to. Word to the wise, only do this if you think you have the patience to spend an hour skiing down a green run. 3. Skate before skiing. One of the best activities you can do with your kids before you go skiing to help prepare them physically is ice skating or in-line skating. These two activities really help to teach kids about dynamic balance – balancing on things that are moving. 4. Introduce skiing before you go. Talk about skiing. Tell your kids stories about you skiing and how much you’ve enjoyed it. Or, how much you can’t wait to learn since it’s always been something you’ve wanted to try. Then show them. Pictures of you skiing or videos. I wouldn’t suggest showing your kids videos of back country heli skiing, crazy jumps and whatnot. No need for risk takers the first time out. (If you or you kids so want to try some daredevil techniques they should check out Woodward. There are some amazing programs!) But you should pull up some online videos of what skiing is, what it looks like and how people do it. Then it’s not so foreign and scary the first time they see it, let alone experience it. 5. Falling is an art form. Ok, not really but it sounds good. Most kids are experts at falling down. Mine are. But, I’ve had both Princesses practice falling down in the snow and the carpet so they’re not afraid of it when we do ski. When I spoke with Guy at Vail he did tell me they don’t really teach kids to fall down. It happens and will happen and most kids are simply used to falling. They don’t seem to get too upset by it. Well, my diva’s do and making it a funny thing beforehand did help Princess One in her lessons…and even now she she tumbles she more adapt at laughing it off, assuming it didn’t “really” hurt. Make sure to understand when you book the class how many children will be in each group; how they divide children into groups; how often they are moved throughout the day; how long they actually ski; how many instructors are in a group; where and when pick-up is when the lesson is over; and if you’re expected to tip the ski instructor. (FYI – you are). The best ski schools in Colorado we’ve done so far include (in this order): Crested Butte, Steamboat Springs, Beaver Creek and Copper Mountain. 8. A lot Rides on Strength and Confidence. As noted in number seven, strength and confidence can dictate a lot on the ski slopes. Think balance – core strength – helping you to catch yourself in a fall and keep you skis straight verses in a pizza wedge. Simple exercises such as sit-ups and squats can help even the littlest kids become better skiers. Making a game of doing these a few weeks before your trip can make a world of difference, for you too. As for confidence, if you can’t smile and be patient skiing with your kids then invest in ski school. Every. Time. 9. Make sure your kids are old enough. Kids must be at least three-years-old to ski at Vail Resort (and all of its properties) but many other resorts require them to be four-years-old so check before you go. I rode up the Gondola with a ski school class of six five-year-olds and their instructor, and when I asked when they had begun skiing they all said three-years-old. He mentioned that’s when a lot of kids start but they’re not always ready – physically or emotionally so it’s important for parents to really gauge their kids and not push. 10. Kids need to be potty trained. Sounds simple but some little ones still have accidents and being on the side of a mountain isn’t the best spot for one. 11. Make sure your kids are ok with being away. If your kids aren’t typically away from you for long periods of time ski school may be hard for them. Kids who go to preschool regularly, away from their parents tend to do better with long separations from their parents. That’s not to say kids who don’t attend preschool won’t thrive in ski school, it’s just parents need to prepare them for the fact they’re going to be in ski school with a teacher learning how to ski without mom and dad. 12. Get the right equipment. Having the right equipment can make or break a day of learning to ski. 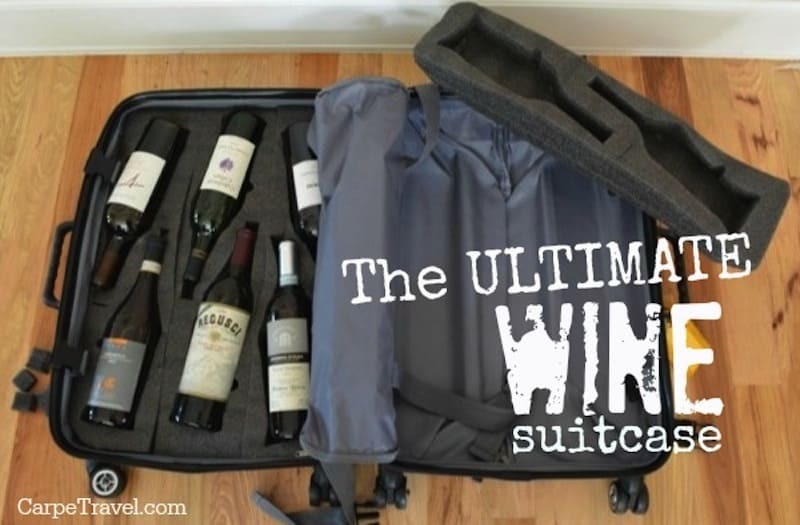 Besides a coat, ski pants and skis the necessities include – Neck gators. Long underwear (not cotton). Moreno wool ski socks. Gloves and glove liners. Helmets that fit properly. Goggles. And the most important – SKI BOOTS. It’s nearly impossible to find “comfortable ski boots” but it is possible to find ones that fit properly and won’t cause toe pains. 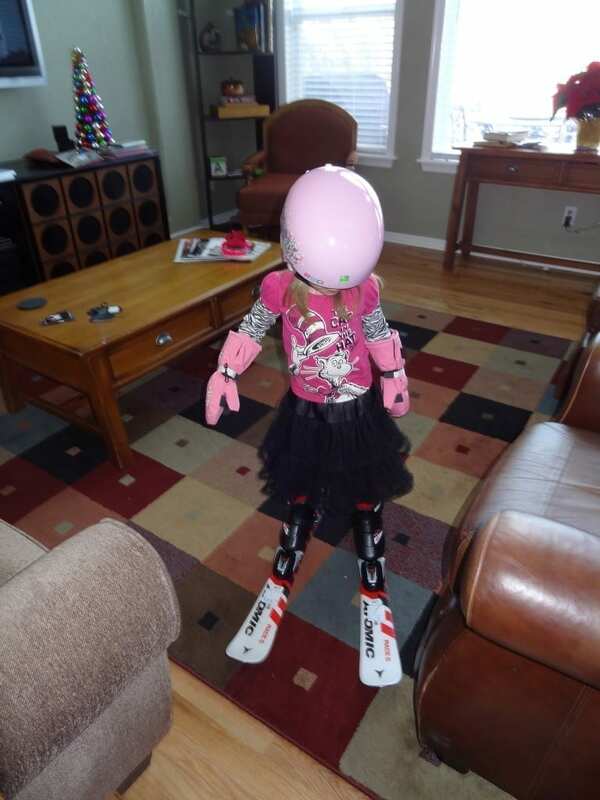 When Princess One was first learning to ski we rented her ski boots a day before we left for our trip so she could wear them around the house – on and off for a few ours – to get used to how they feel. If you’ve worn ski boots, you know how different and cumbersome they can be. We walked up and down the stairs, practiced falling in the snow in the backyard, played a few games and simply got used to how they felt. It also told me they fit her and she wouldn’t be in pain the next week on the mountain. Something to consider, rent/reserve your equipment online before your ski trip to save money AND ensure you get the equipment. I’ve also found it’s best to rent from a company that has a location on the ski mountain in case there is a problem with anything. They can simply trade out the sizes or make adjustments on site so you never have to leave the mountain. 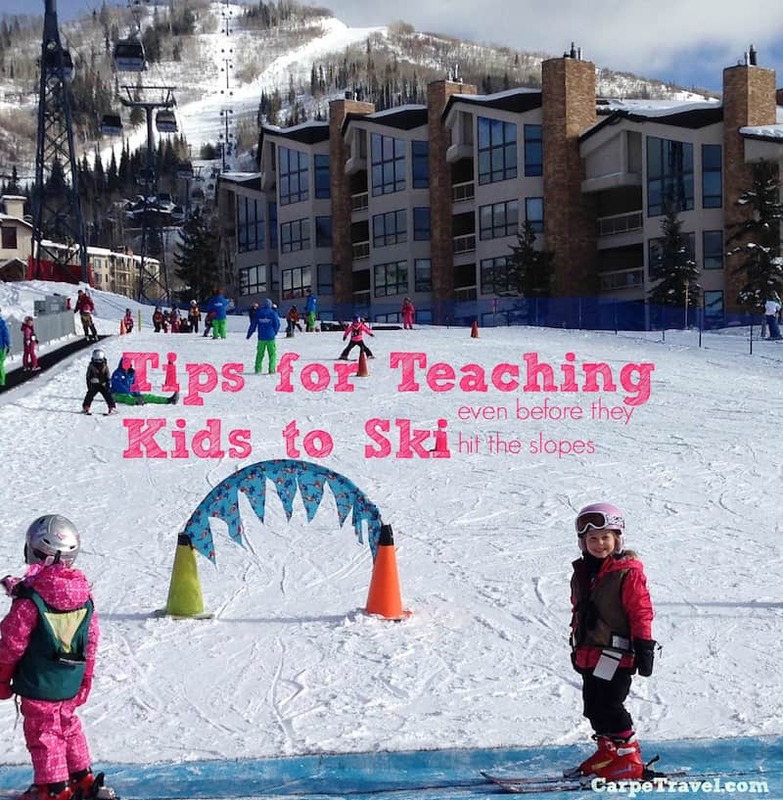 Were these tips on teaching kids to ski helpful? Pin this image to save them for later! This is a great post! If only I had read it before we headed up to Winter Park and Vail this week. :) Luckily, my kids took to skiing like a charm. It was me who needed the extra help. Ha! Yes, I saw your post (http://ow.ly/ibuJW). Thanks for reading and I hope you enjoy your next ski day (if there’s a next). Great tips! My kids started when they 4 & 6 awhile ago but I wish I knew about some of these. It does make sense to start them with ice skating first. My 7-year-old son switched to snowboarding lessons last month and “Falling is an art form” was the norm with him. 🙂 Totally agree on the right equipment with everyone in the family. Your son is right, falling when you snowboard is totally an art. Thanks for reading! Awesome! I could use these tips for my son who is about to take his first ski lessons 🙂 Thanks Elaine. Great tips! 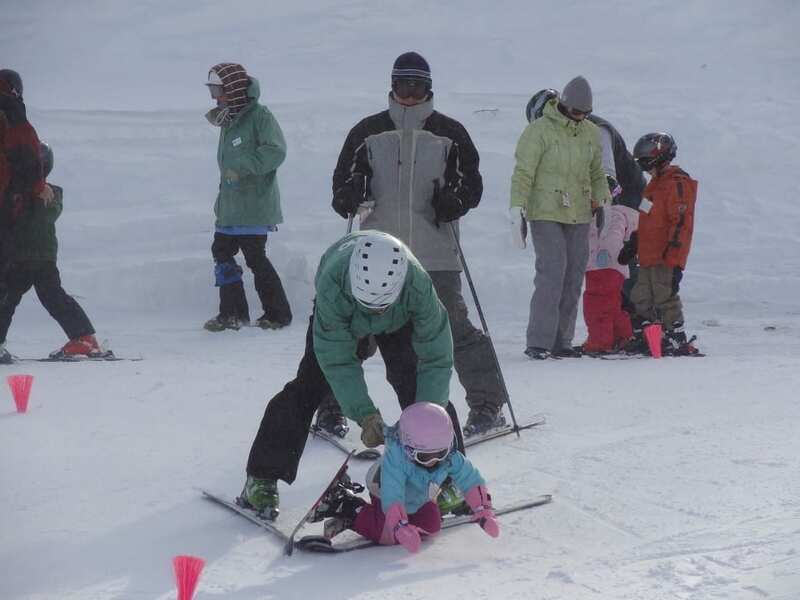 Ski class with a certified instructor is a great idea for the kids. Sometimes they learn better if neither Mom not Dad are teaching them! NOR, I meant to say nor!! Golden words: 5. Falling is an art form. Our instructor was teaching children falls a long time. And that was a real benefit. Children do not complain that they hurt, because falling correctly. Totally agree! Thanks for stopping by and sharing. 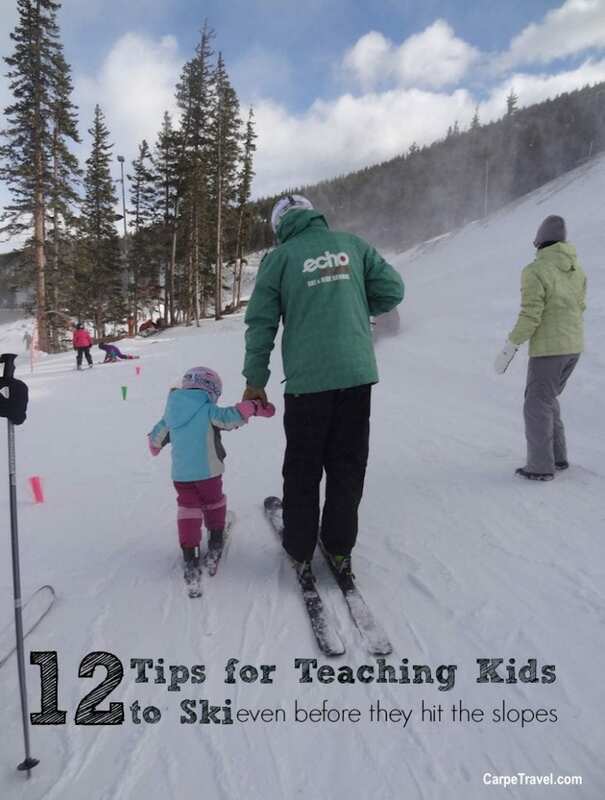 Great tips for teaching kids to Ski. Thank you for this great article – such simple yet undervalued tips that make such a huge difference in helping ease our little ones into the skiing world. I hope to see many more article like this one, and raise awareness with parents who are preparing to put their kids on skis for the first time! Thank you! Thank you for sharing these helpful tips. Looking forward to more posts from your blog!